Buffalo Abrasives offers a complete line of resin, rubber, shellac and vitrified bonded abrasive products for a wide variety of applications and industries. With fully integrated, in-house facilities, we focus on high performance, special, made-to-order products. 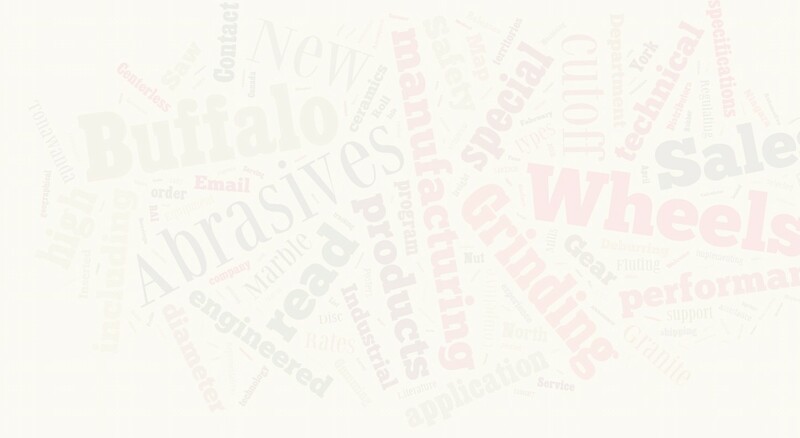 Founded in 1988, Buffalo Abrasives, Inc. is located in North Tonawanda, New York in facilities that were formerly National Grinding Wheel. The company's owners and management team are fourth generation descendents of John J. Russ, founder of National Grinding Wheel in 1923. 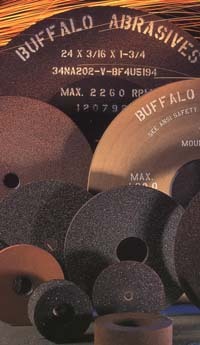 This rich history gives Buffalo Abrasives years of experience in manufacturing grinding wheels and more continuity than most other wheel manufacturers. Resin, Rubber, Shellac and Vitrified Bonds including: Bench and Pedestal Wheels, Cam Wheels, Centerless Wheels, Chip Breaker Wheels, Crankshaft Wheels, Cutoff Wheels, Cylinder Wheels, Cylindrical Wheels, Dental Wheels, Depressed Center Wheels, Dresser Wheels for Pencil Edging, Fluting Wheels, Gear Deburring Wheels, Glass Wheels, High Speed Gas Saw Blades, Internal Wheels, Nut Inserted Disc Wheels, Plate Mounted Disc Wheels, Raceway Wheels, Regulating Wheels, Roll Grinding Wheels, Saw Gumming Wheels, Segments, Surface Grinding Wheels, Snagging Wheels, Stone Trade Wheels, Thread Grinding Wheels, Tool Room Wheels and others. Industries including: Aerospace, Aluminum Mills, Automotive, Bearings, Boat Building, Brick & Tile, Broaches, Ceramic Products, Construction, Cutlery, Cutting Tools, Dental Equipment, Foundries, Gears, Glass Products, Golf Clubs, Granite, Jewelry, Leather Tanneries, Machinery, Marble, Medical Instruments, Metal Fabrication, Oil Field, Paper Mills, Plastics, Precision Gages, Railroad Equipment, Rubber, Saw Blades, Ship Building, Springs, Steel Mills, Valves and others. Content and Images Copyright © 2013 Buffalo Abrasives, Inc.